It's that time of year in Indianapolis. You don't have to eat everything, but you'll have a hard time choosing from so many great restaurants and menus. Beginning August 8th at many downtown restaurants, Devour Downtown brings together the best of Indianapolis dining so you visit your favorite restaurant or try a new one. With almost 50 participating restaurants, you're sure to find something you like at a place everyone can agree on. Gather your friends for a party or enjoy an intimate dinner with your loved one. Many restaurants will be showcasing their signature dishes and offering a great deal. 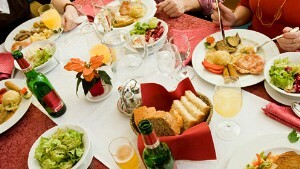 Depending on the restaurant, you can get 2 meals for $30.00 or $30.00 a person. Whether you're favoring a great steak from Ruth's Chris, fried pickles and a brew at Scotty's or seafood at McCormick and Schmick's, this is the time of year your tastebuds will be screaming. Check out their site for participating restaurants, menus and reservation information. I think we'll be going a couple of times and I want to try Fogo de Chao. Which restaurant would you like to visit during Devour Downtown? Thanks for the information regarding the eateries in the downtown area, everything sounds great and I can't wait to try out some of the restaurants.